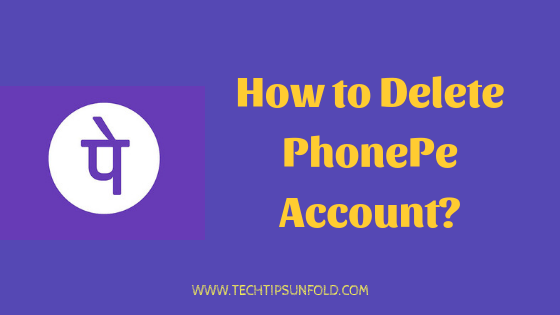 How to Delete PhonePe Account Permanently – Looking for a simple way to delete your phonepe account? Then you are in the correct place. Keep reading here for the precise guide. We will let you how to delete phonePe account in a step by step guide and the precautions to be taken before proceeding with the deleting phonepe account. PhonePe is one of the India’s leading UPI based payment app. It revolutionised the payments system with cashless payments and seamless payment experience. From paying bills to mobile phone recharge, from insurance premium to credit card bill payment, you can do everything with PhonePe account. Utility Bills – Electricity Bills etc. Shopping on ecommerce websites like Flipkart, Myntra, Jabong etc. Have you tried and searched for straight-forward delete phonepe account option? There is no delete button available on PhonePe app. Yes, you need to do some workaround in order to delete phonepe account permanently. 2 How to Delete PhonePe Account permanently? Deleting PhonePe account may be an irreversible process. So follow these precautions if you choose to delete your PhonePe account. 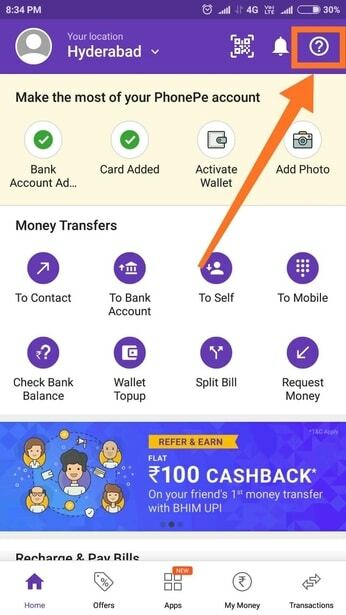 If you have any money in your PhonePe wallet, transfer it to your bank account. If you have any non withdrawal amount which you got through cash back offers, use it for mobile or DTH recharges. Make sure you have an empty wallet before you delete PhonePe Account because you may lose all your hard earned money in your PhonePe wallet. So without much ado, let’s jump in to the topic on How to deactivate PhonePe account permanently? If you wish to delete your PhonePe account for any reason, There are few ways you can do it. Just follow any of the mentioned methods here in this article on How to Delete PhonePe account. Both the methods are simple and easy to follow. As you are aware, PhonePe is available only on Mobile app platform – Android & iOS. So you need to have PhonePe app installed on your Android or iOS mobile to delete your account. If you have uninstalled the PhonePe app earlier, you can download it from the playstore link mentioned in this article. Once you have PhonePe app installed, do follow the following step by step guide to delete PhonePe account. Step 1: Open PhonePe app on your mobile phone. Once you open the app, you will find help section like icon at the top most right corner as shown in the image below. Just tap on the icon. Step 2: Now you will get list of topics in the Help section. Choose PhonePe account to get all the queries related to that topic. Step 3: You will get list of question and answers related to PhonePe account. Find Deleting an account option and click on it. Step 4: Once you click on Delete Account option, following message will be displayed – We are sorry you had a bad experience with PhonePe. Do let is know what went wrong with us so that we can try to fix the issue. Click on Contact Us option to raise a ticket with PhonePe support team. Once you have raised a support ticket, it may take 2-3 working days to delete your phonepe account. If you have any specific issue or bug found on PhonePe app, you can report the same to them. They will try to fix the issue. But if you desperately wanted to delete account with PhonePe, then you can mention the same and request them to delete. You will get a notification once they delete your PhonePe account. They may even ask for more details like why you wanted to leave PhonePe. Another simple and alternate method on How to Delete PhonePe account is to directly send out a mail to PhonePe support team requesting to delete your account. Their support team is actively responding to email queries. So you can just send a mail to them directly to delete your phonepe account. Following are the email id, subject and body you can use. I would like delete my account with PhonePe. Please consider my request and delete PhonePe account. Following are the details associated with the account. Open your registered email account with PhonePe and draft the email with the mentioned details. Just send this mail and they will respond within 2-3 days with the resolution. If you want to delete phonepe account now itself, then you can call the help desk team on 0124-6789-345 mobile number and ask them to delete your account. They will consider your request and proceed with the account deletion option. You can follow other alternative options like – De-link all the bank accounts associated with your PhonePe account and simply uninstall the app. If you unsubscribe to their mailing list, you will not get any further emails or communications from PhonePe team. You can consider this as an alternative to deactivating your PhonePe account. PhonePe is 100% secure, fast and reliable platform for funds transfer, recharges and many more things. You can even get exciting cash back offers with PhonePe on hotel, cabs, food and flight bookings. PhonePe changed the way we do money transfer. There are many apps like Tez emerged into this space after PhonePe’s success. If you wish to delete PhonePe account by any chance, we have listed down three methods for you. Follow any of the ways and get it deleted within few days. But do remember to follow the precautions mentioned before raising a request with the PhonePe team. I’m concluding this article on How to Delete PhonePe account or How to Deactivate PhonePe account. If you have any queries regarding the same, you can let us know through the comments. We will be glad to help you out. Cheers! How to Delete Quora account Permanently?